In order to ensure the highest levels of network performance, seamless compatibility and upgrades with our NoviSwitch and NoviKit products, NoviFlow offers a complete line of high-performance and cost-effective SFP Transceiver Modules. Moreover, for optimal installation of our Series 2000 NoviSwitches, we offer two sizes of Rail Mounting Kits. NoviFlow transceivers have been carefully selected and are specifically configured to ensure optimal compatibility and performance with NoviFlow’s NoviSwitch and NoviKit products. Every NoviFlow transceiver has been individually configured and tested at the factory to ensure conformance to NoviFlow’s high-quality standards. As a consequence, NoviFlow transceivers reduce potential customer headaches and ensure the smoothest possible maintenance and upgradability of our switch products for the best in-service performance and lowest total cost of ownership. They also ensure forward compatibility with new features as the NoviSwitch software evolves and is upgraded over time. The NoviConnect 503 SFP+ SR Transceiver (10 Gbps over fiber) is a high performance, cost effective module supporting dual data-rate of 10Gbps and supporting distances up to 300m over MMF at 850 nm. The NoviConnect 504 SFP+ LR Transceiver (10 Gbps over fiber) is a high performance, cost effective module supporting dual data-rate of 10Gbps and supporting distances up to 10km with SMF at 1310 nm. The NoviConnect 505 SFP SX Transceiver (1 Gbps over fiber) is a high performance, cost effective module supporting dual data-rate of 1Gbps and supporting distances up to 550m over MMF at 850 nm. The NoviConnect 506 SFP EX Transceiver (1 Gbps over fiber) is a high performance, cost effective module supporting dual data-rate of 1Gbps and supporting distances up to 40km over SMF at 1310 nm. The NoviConnect 507 SFP LX Transceiver (1 Gbps over fiber) is a high performance, cost effective module supporting dual data-rate of 1Gbps and supporting distances up to 10 km over SMF at 1310 nm. The NoviConnect 508 SFP+ ER Transceiver (10 Gbps over fiber) is a high performance, cost effective module supporting dual data-rate of 10Gbps and supporting distances up to 40 km over SMF at 1550 nm. The NoviConnect 509 QSFP+ SR4 Transceiver (40 Gbps over fiber) is a high performance, cost effective module supporting dual data-rate of 40Gbps and supporting distances up to 150 m over MMF at 850 nm. The NoviConnect 510 is an OM3 cable that supports 10 Gigabit Ethernet at lengths measuring up to 300 meters, and 40 Gigabit or 100 Gigabit Ethernet measuring up to 100 meters. The NoviConnect 511 QSFP28 SR Transceiver (100 Gbps over fiber) is a high performance, cost effective module supporting dual data-rate of 100Gbps and supporting distances up to 100m over MMF at 850 nm. The NoviConnect 512 40G QSFP + passive optical cable is a high performance, low power consumption, long reach interconnect solution supporting 40G Ethernet, fiber channel and NIC cards. It is compliant with the QSFP MSA and IEEE P802.3ba. The NoviConnect 513 QSFP-40G + active optical cable is a high performance, low power consumption, long reach interconnect solution supporting 40G Ethernet, fiber channel and PCIe. It is compliant with the QSFP MSA and IEEE P802.3ba 40GBASE-SR4. QSFP AOC is an assembly of 4 full-duplex lanes, where each lane is capable of transmitting data at rates up to 10Gb/s, providing an aggregated rate of 40Gb/s. 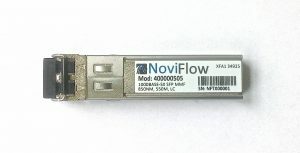 The NoviConnect 514 40G QSFP + ER Transceiver offers up to 11.2Gbps data rate per wavelength, with a reach of up to 40km transmission on SMF, is certified for optimal performance with NoviFlow switching products, and is fully compliant with MSA (Multi-Source Agreement) standards. The NoviConnect 515 40G QSFP + LR Transceiver operates four independent full-duplex channels, offers up to 11.2Gbps data rate per wavelength, with a reach of up to 10km transmission on SMF, is certified for optimal performance with NoviFlow switching products, and is fully compliant with MSA standards. The NoviConnect 516 SFP TX Transceiver (1 Gbps over copper) is a high performance, cost effective module compliant with the Gigabit Ethernet and 1000- BASE-T standards as specified in IEEE 802. 3-2002 and IEEE 802.3ab, supporting a 1000 Mbps data-rate up to 100 meters reach over unshielded twisted-pair CAT 5 cable. The module supports 1000 Mbps (or 10/100/1000Mbps) full duplex data-links with 5-level Pulse Amplitude Modulation (PAM) signals. The NoviConnect 517 SFP TX Transceiver is an Industry Standard 10Gbase-CU SFP+ Direct Attach Copper Cable that operates from 1 to 10.5Gb/s, supports 10G Ethernet and 10G fiber channel, is certified for optimal performance with NoviFlow switching products, and is fully compliant with MSA standards. The NoviConnect 518 SFP TX Transceiver is an Industry Standard 100GBase-LR4 QSFP28 Transceiver that supports 100 Gigabit Ethernet and up to 10km transmission distance with SMF, is certified for optimal performance with NoviFlow switching products, and is fully compliant with MSA standards. The NoviConnect 519 10G SFP+ CU Transceiver is an Industry Standard 10GBase-CU SFP+ transceiver supports 10 Gbps over copper cable and links up to 30m using Cat 6a/7 cable, is certified for optimal performance with NoviFlow switching products, and is fully compliant with MSA standards. NoviFlow’s Series 2000 NoviSwitch Rail Mounting Kits are designed to provide optimal installation of series 2000 NoviSwitches in industry standard 19 inch racks. Our rail kits have been fully tested and validated to ensure the best quality. The Series 2000 NoviSwistch Short Rail Mounting Kit is designed for use with standard 19 inch racks, with a depth of 48.26 centimeters (19 inches) to 67.56 centimeters (26.6 inches). The Series 2000 NoviSwistch Long Rail Mounting Kit is designed for use with standard 19 inch racks, with a depth of 65.02 centimeters (25.6 inches) to 83.95 centimeters (33.05 inches).